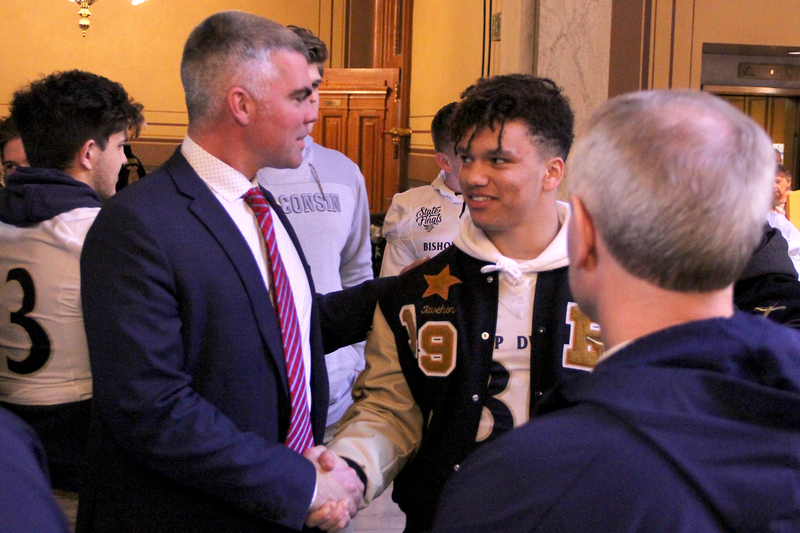 STATEHOUSE (March 5, 2019) – State Sen. Liz Brown (R-Fort Wayne) and State Rep. Bob Morris (R-Fort Wayne) recently honored the Fort Wayne Bishop Dwenger Saints high school football team at the Statehouse. The Indiana legislature continues to focus on expanding Indiana’s labor pipelines and growing our workforce. Lawmakers are addressing workforce issues on all levels, including preparing our students and skilling up underemployed Hoosiers. Creating a modern workforce development program and expanding education opportunities for our youth are issues extremely important to me, and I supported several bills to help meet these goals. STATEHOUSE (March 1, 2019) – State Rep. Ron Bacon (R-Chandler) and State Sen. Mark Messmer (R-Jasper) will host a legislative update in Chrisney on Saturday, March 9. This week the legislature wrapped up the first half of the 2019 session. We passed 201 bills out of the House, and we expect to receive just as many from the Senate to consider during the second half of session. I am sponsoring 12 different Senate bills and look forward to telling you more about those in the coming weeks. The 2019 legislative session reached its halfway point this week. Senate bills now move over to the House for consideration, and House bills crossover to the Senate. House Republicans have made significant headway on our priorities, including passing an honestly balanced budget. The two-year state budget proposal includes significant funding increases for education and school safety. The 2019 legislative session reached the midway point, and significant progress was made to pass an honestly balanced budget and address issues facing Hoosiers. Of the 201 House bills moving to the Senate for consideration, 75 percent were passed with bipartisan support. After being supported by House members, two bills I authored to help our community are moving forward. The Indiana General Assembly is officially halfway through the 2019 legislative session. House Republicans made great progress finding solutions on important issues facing our state. We passed proposals that would fund vital state services through the next two years, increase school safety, strengthen our workforce and support foster children. After being supported by House members, these bills will be heard by the Senate. My legislation moving to the Senate focuses on public health trainings, developing more efficient methods for Medicaid audits and curbing the opioid epidemic. One century ago, the first woman legally cast her ballot in an American presidential election. In honor of this important moment in American history, I co-authored legislation recognizing the legacy of women’s suffrage in our country. Suppose the Indiana General Assembly closed its doors and disassembled. Suppose Gov. Holcomb turned to Washington, D.C., for approval of state spending. Would you be a happy Hoosier? STATEHOUSE (Feb. 25, 2019) – The Indiana House of Representatives today voted in support of legislation co-authored by State Rep. Stephen Bartels (R-Eckerty) to allow reserve police officers to continue their law enforcement education while serving their communities. STATEHOUSE (Feb. 25, 2019) — State Reps. Cindy Kirchhofer (R-Beech Grove) and Mike Speedy (R-Indianapolis) will host a town hall meeting Saturday, March 9, to discuss the legislative session. Indiana is ranked among the top 10 in the nation for its business climate and pro-growth policies, but more needs to be done to build up our workforce and better prepare Hoosiers for careers in high-demand fields. House Bill 1002, which I voted in favor of, would reallocate existing state funds to proven workforce programs so Hoosiers can increase their certifications, earn stackable credentials and secure higher-paying jobs in sought after fields. STATEHOUSE (Feb. 25, 2019) – State Rep. Tim Wesco (R-Osceola) recently welcomed NorthWood Middle School students to the Statehouse. Each year, more than 35,000 people in Indiana are diagnosed with some form of cancer. 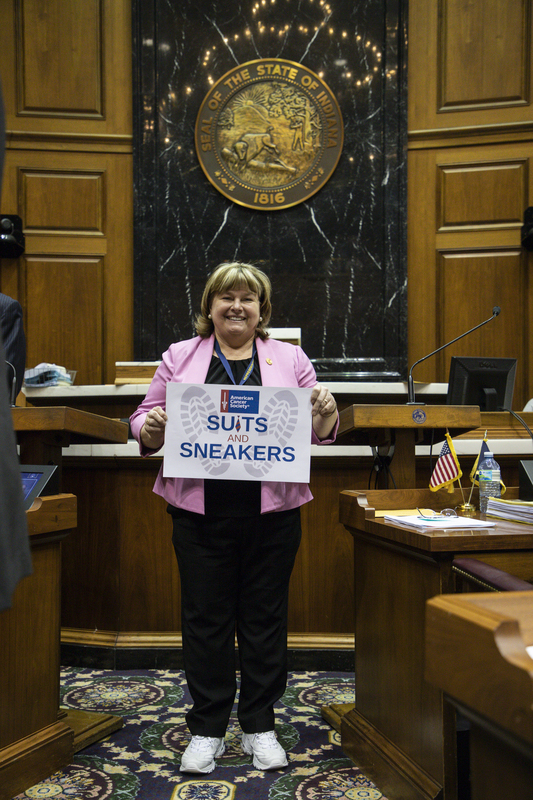 In an effort to raise awareness and encourage Hoosiers to take more preventive measures against this disease, I participated in the Suits and Sneakers challenge at the Statehouse. The event is part of a nationwide effort by the American Cancer Society and the National Association of Basketball Coaches to highlight the need to adopt healthy habits to prevent cancer. While we had fun wearing our sneakers with our professional attire, it was an important reminder that too many are impacted by this devastating disease.